The landscapers still has not got back in touch with me. I will have to send him another message to prod him along. The ground is still a little damp to do what is needed, but he certainly could begin dismantling the front walk. My mother is moving in around the end of May. I found this definite time frame out this past Sunday when she called me. Apparently her agent believes the house will sell very quickly as there are six people already interested in the house even before it goes on the market next month. This has caused me to PANIC! I have not completed working on her room as of yet nor have I started to pack and move out of the library / office space that I will be giving her for her sitting room. This part of her moving in was to be done while she was visiting this summer, but now I must move this project up to the forefront. During the weekend I toiled in the ‘garden.’ Though it can be said there is no garden at present I felt as if I were. More plants arrived and had to be planted in containers and added to the expanding collection of potted plants. I also managed to weed one of the beds in front of the cottage and I edged it with bricks that I found in a pile under the magnolia trees. It’s the only area in the back of the house that has a finished look. As I spent more time outside this weekend I took notice of how the sunlight hit the ground and discovered a problem. I believe the back garden area will receive about 4 ½ hours of full sunlight then as the sun moves to the side of the house and eventually towards the front the shadows start to move in and block off large sections. I have come to the conclusion it will not be a sufficient amount of light for most vegetables and possibly some flowers too. This predicament has led me to come to the radical idea of moving the vegetable garden or at least most of it to the front of the house. I suggest “radical” because the idea of a vegetable garden planted at the front of a house is radical to some people. In fact there are towns that have laws strictly forbidding the practice, which is odd to me. 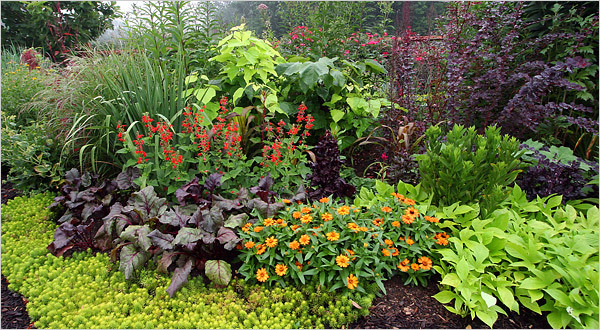 My plan is to mix flowers and vegetables together and mainly plant those vegetables that require six or more hours in the front garden. I have researched this idea online and found some lovely examples. I also think I’ll plant vegetables in the front and back and see which side is the most productive. 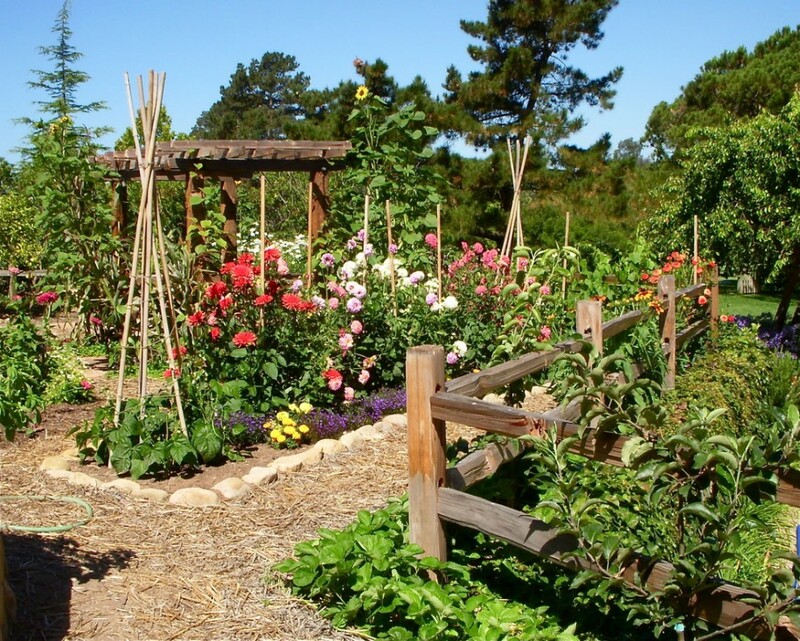 I believe the combination of planting flowers and vegetables should appease those who would criticise the idea of vegetables being planted in front of a house. I firmly believe not one person in this town should complain about this because we have a particular problem where some individuals park their cars in the front yard and there are no ordinances which state they cannot. I also checked with our town ordinances concerning having a vegetable garden in the front yard and there are none. If people can park a car in a front yard I certainly may plant a vegetable garden in the front of my house. Since I have been waiting on the landscapers before I can begin planting my beds I decided to shift my focus to the front porch and add some life to it. I continued to put up the sunshades and added two more to the seating area. What a difference these shades make in the hot sun. I also installed new brackets to hang the pots of mandevilla from last year. 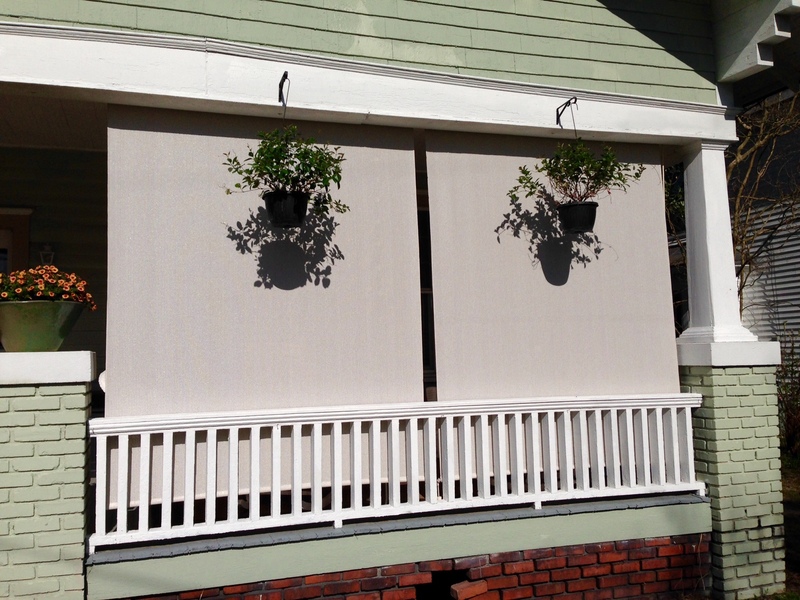 I placed the brackets on the outside of the frame so that the mandevilla won’t interfere with the sunshades. As you can see the sun is very bright. Before these sunshades went up you would find yourself very uncomfortable in a short amount of time. In fact the sun came in so strong it would melt the candles. 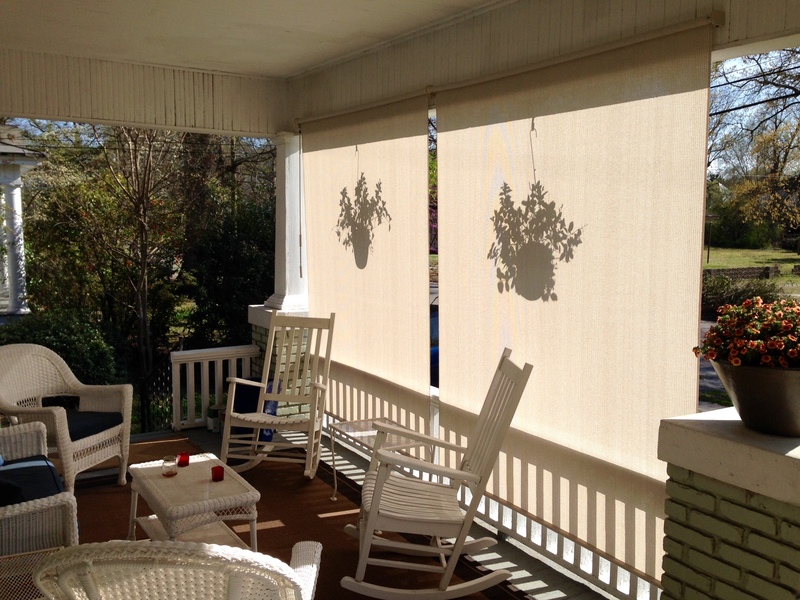 These sunshades also cut out much of the heat and lowers the temperature by a couple of degrees. 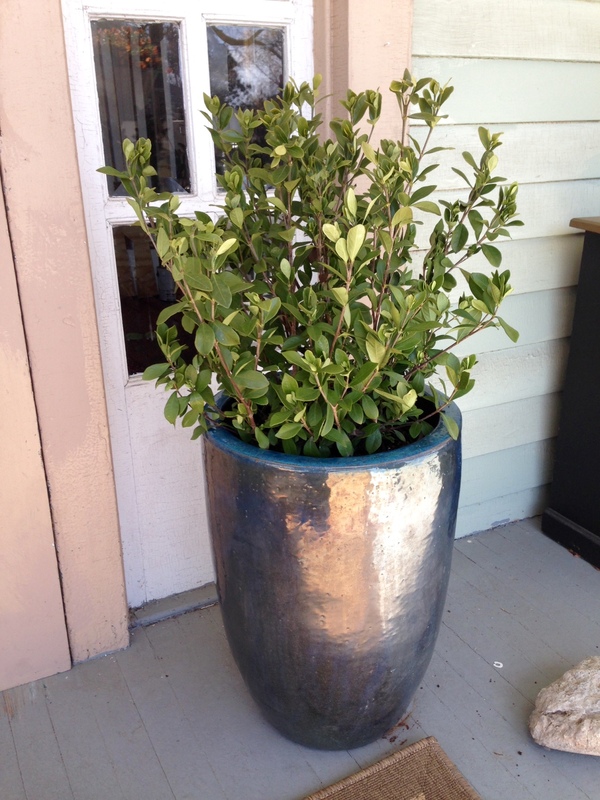 We had two planters on the either side of the door that we have had for a while, but they were made of tin and had rusted beyond use so I purchased new ones made of clay and heavily glazed in shiny teal blue color. Last year due to the extreme sun on the front porch the normal use of ferns came to an end because they got fried. So this year I chose something more permanent and decided on gardenia bushes. One of two new pots on either side of the front door with gardenia. I also got some ornamental grasses to go on either side of the front steps and two African daisies to liven things up a bit. The porch is coming together nicely and will be a nice place to sit and tend to the plants since it looks like I have no idea if and when a garden will happen. Thank you! I am happy how it is coming along and I think my mother will enjoy it too.